Ambition is a double-edged sword. Without it, Tobias Forge’s dream of becoming a world-conquering rock star would never have been fulfilled, he would have never had the producer behind Robyn take a stab at metal music, and he would’ve never turned unabashed Blue Öyster Cult grave-robbing and impeccably clean hooks into one of the most popular new metal acts of the 2010s. However, that same ambition turned grotesque on INFESTISSUMAM, a trainwreck of a sophomore record whose autopsy could take a few dozen pages, and lead several “Nameless Ghouls” to sue him for withholding royalties, turning Ghost into a solo project. PREQUELLE is further proof of the duplicity of Forge’s ambition, as it is simultaneously his most musically ballsy and disjointed project so far, and its thematic cohesion is ruined by unignorable references to real-life drama. Rest assured, Ghost’s core of hyper-melodic proto-metal is still going strong. The heaviness has been toned down from MELIORA, but the change in producer has not altered how crisp and punchy it sounds; “Rats” and “Faith” are a one-two punch of classic, blues-y riffs and psychedelic keyboards that go toe-to-toe with anything on OPUS EPONYMOUS. Since Ghost favors groove over technical ability, one of their persistent flaws has been their lackluster, solo-heavy instrumentals. However, “Miasma” is an unexpectedly perfect slice of Camel-esque instrumental prog rock topped off by an unexpected sax solo, and showcases Ghost at their most dynamic and flashy. It does Opeth’s schtick better than Opeth’s recent output, which makes sense given producer Tom Dalgety’s work with them. Besides the ‘70s, Forge has seen fit to lift from the ‘80s as well, KISS and Queen in particular. Ghost’s theatricality should be a perfect fit, but the results aren’t as fun as expected. Much like INFESTISSUMAM, the guitars aren’t allowed to open up and soar as much as they could. When the solo on “Pro Memoria” is approaching and you’re expecting a bombastic climax, the band goes for a distorted, psychedelic tone that plays second fiddle to violins and pianos and kills the momentum. The end result is too pretty and not atmospheric enough to support Forge’s eerie vocals, and the hook-centered songwriting doesn’t translate well to ballads. MELIORA’s “He Is,” a subversive ode to Satan as musically clean as a traditional worship hymn, worked because it contrasted MELIORA’s doom-metal edge; the same contrast doesn’t happen when the music is more akin to poppy arena rock. All of Ghost’s albums are conceptual, and while they typically flow very well, the narrative and emotional arcs are not as important as the hooks. PREQUELLE stands out as their most immersive record to date. From the opening interpellation of “Ring Around the Rosie” that transitions into a ghoulish keyboard line on “Ashes,” the album engulfs the listener in the paranoia and spiritual dread of Europe in the time of the Black Death. “Rats” and “Witch Image” illustrate the fragility of life and how easily it could be snuffed out by a force that could only be comprehended as a supernatural punishment sent by the Devil itself. However, even with its four-on-the-floor drumbeat and shameless puns, “Dance Macabre” is the album’s most poignant track. As the plague itself is on the protagonists’ doorsteps and they know the end is nigh, they ask their suitor if they can spend their last night on Earth together. From the band who have written songs like “Year Zero” and compared humanity to lice, it’s a touching testament to our ability to find joy and companionship even in despair. The lawsuits and Forge’s bruised ego bleed into PREQUELLE in an occasionally ugly way. The worst example of such is “See The Light,” the lamest song Ghost has ever put together. Even though it works within the album’s plotline, it’s not hard to see lines like, “Every day that you feed me with hate / I grow stronger” as aimed squarely at former members, and they just make Forge seem pathetic. “Faith” takes shot at his former bandmates for making a new band that he sees as ripping Ghost off, and the chorus likens him to a religious deity during the Plague, watching and waiting for their downfall. There is certainly cleverness to Forge’s disses, but the mood can turn petty and bitter when the music calls for something more immersive and imaginative. Again, it’s not as misplaced as the vulgarity of “Idolatrine” and “Jigolo Har Megiddo” on INFESTISSUMAM, but it’s incredibly distracting when the rest of the lyrics do such a good job of replicating the sounds, sights, and emotions of the Black Plague. 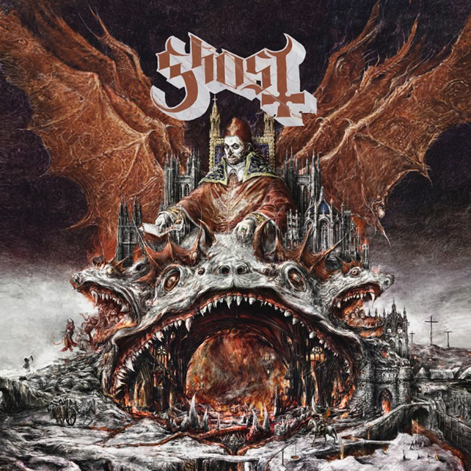 I wasn’t certain on whether Forge’s loss of anonymity would cause me to view PREQUELLE differently than other Ghost albums, and it unfortunately did. The melodies that made them stand out among other proto-metal revivalists are still present, and the progressive flourishes and conceptual arc are more fleshed out than ever. However, without the anonymity and with more accessible music, Ghost no longer comes across as visitors of their own supernatural world that they could only describe through music Rather, it comes across like the product of a creative genius who wants to tour the world, be famous, and use the music to air his emotional laundry. If that’s what Ghost is going to be from now on, then that’s fine, but I hoped it would be more fun than this.